There’s definitely something soul-warming about a bowl full of spicy chili on a brisk fall Sunday, particularly if it comes with cornbread. 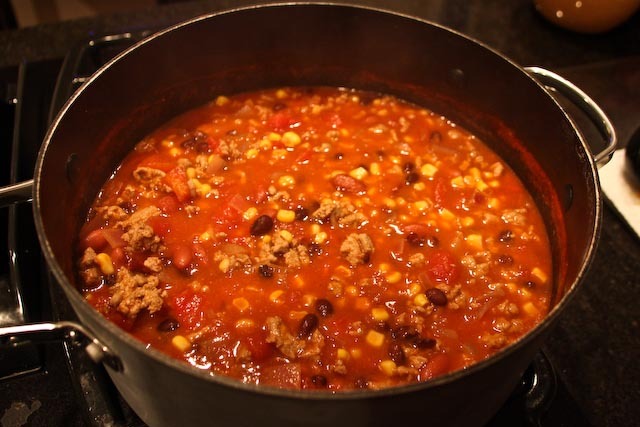 Chili is a definitely a crowd-pleaser – particularly for football fans you may be hosting to watch the week’s Big Game – and it’s super easy and relatively cheap to make. For this chili, I combined just a few simple ingredients to make a flavorful, spicy, and healthy meal. The chipotle flavor comes from adding diced chipotle peppers in adobo sauce, which can be found in the international or Hispanic foods isle of your grocery store. I just used two chipotle peppers, but you could add more for a little added picante! I also chose to use ground turkey, but if you prefer to use ground beef, power to ya. This chili can be whipped up in about a half hour, but the longer you let it simmer, the better it will taste, as the flavors will have even more time to meld together. It’s also superbly easy to double in order to feed even more hungry mouths. 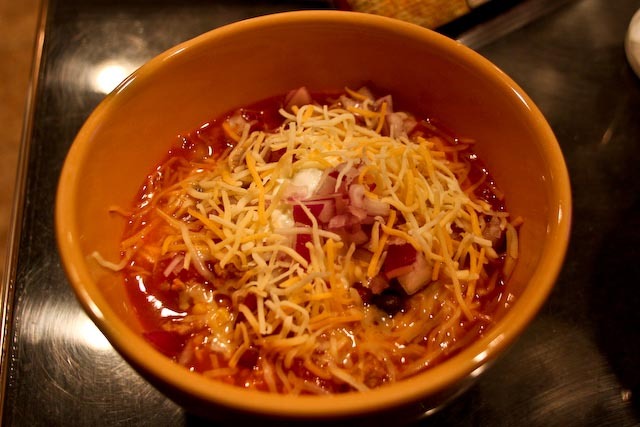 I top my chili with shredded cheddar cheese, sour cream (yes, sir! ), and diced red onion. Top yours with whatever garnish floats your chili boat! In a large pot, heat oil over medium heat. Add onion and cook for a few minutes until translucent. 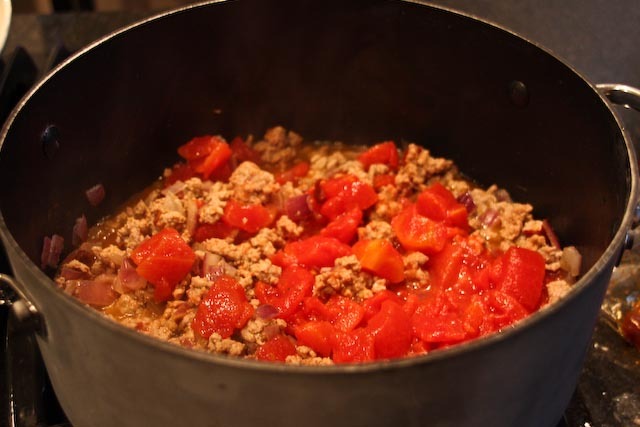 Add ground turkey meat and break up with a wooden spoon so that it crumbles and cooks evenly. Cook turkey meat for a few minutes, then add chipotle peppers, cumin, chili powder, and salt and pepper and stir to coat meat with spices. 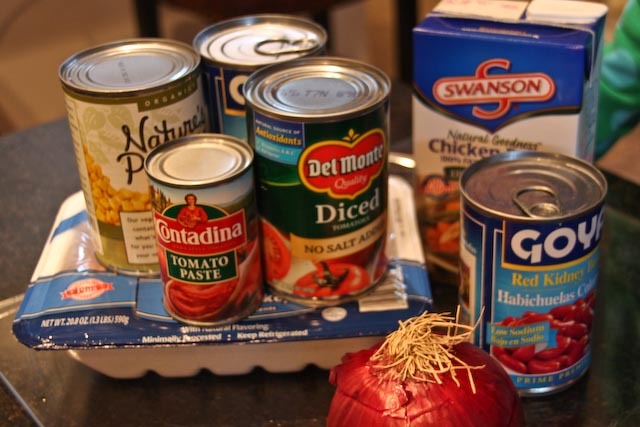 Add tomato paste, diced tomatoes, corn, kidney beans, black beans, and 3 cups chicken broth. Reduce heat to low, cover the pot and simmer for at least 20 minutes (the longer the better). Be sure to stir every now and then to avoid sticking or burning on the bottom. You may need to add additional broth to reach desired consistency. Serve warm and top with cheese, sour cream, diced onions, or other favorite garnish. ← The Best Pumpkin Bread. Ever.